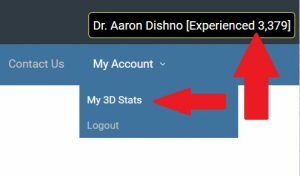 After you log in, the My Stats webpage can be found two ways; click your name on the right side of the header or select the My Stats menu option under the My Account menu item. The webpage you see has two sections (so far – it will grow as we go); My Stats Score and My Stats Progress. The My Stats Score is the top half of the My Stats page. This half provides your Rank, Score, and a breakdown of the parts that make up your score. you will receive points. (It is likely that I will later add code to exclude 3D Objects that have less than a minimum number of 3D Building Blocks, so you will need to actually build the 3D Object not just start it). Notice that these points are small compared to the next sections. Creating is great, but the real points are given for what you do with the 3D Objects. The Second Section provides scores for 3D Objects you Shared. Sharing 3D Objects adds them to the searchable list of 3D Objects you can add when you Create a New 3D Object. You are Sharing your 3D Object for others to have a copy, therefore, you get more points for helping others! The Third Section provides scores for 3D Objects you Shared that other users have Downloaded and used. Sharing gets your 3D Object on the list, but the real test is if you created something that others can use. This are the greatest points awarded (so far). 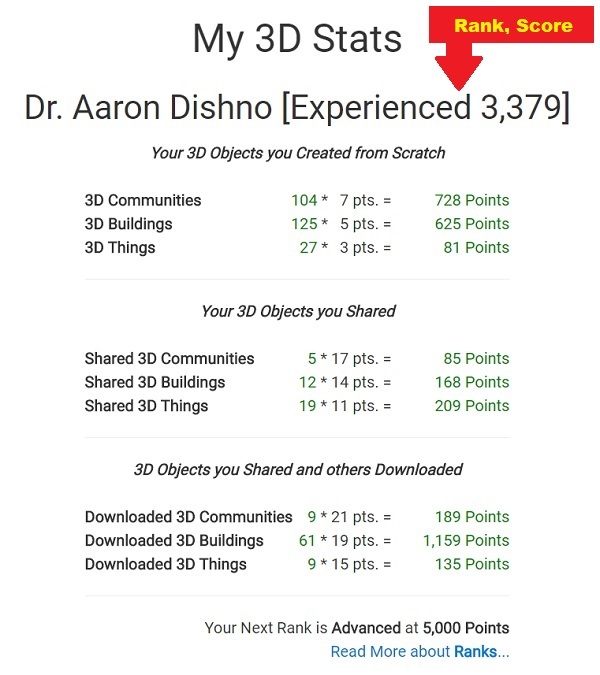 Consider that when you share a 3D Object you get the points once, but you get the points for every time they are downloaded and used by different people. 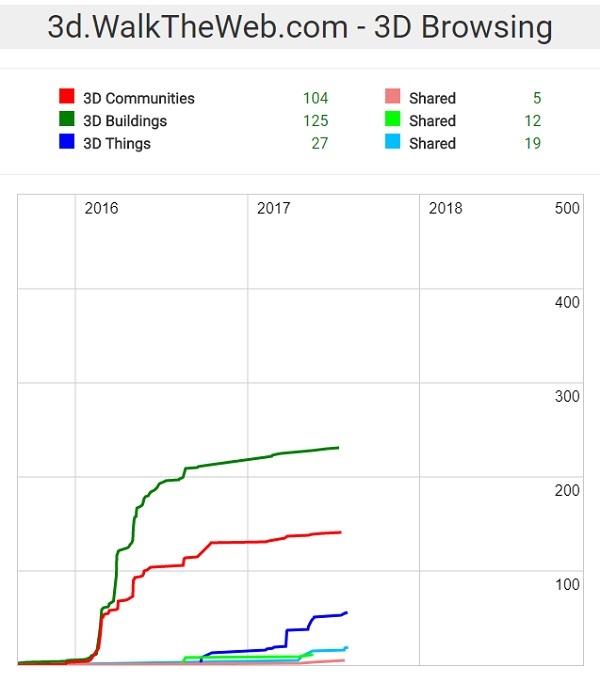 The bottom half of the My Stats webpage shows your current number of 3D Objects, Shared 3D Objects, and a graph based on when the items were created or shared. This sets a picture of your growth and participation over time. This article explains how we calculated the score. You can read about all of the Ranks and requirements for advancement in the next article.